A typical modeling methodology involves selecting the appropriate model formulation based on device physics and the device’s final application in a circuit, making the necessary physical measurements to characterize a device or a set of devices, and then applying extraction algorithms to calculate the model parameters and minimize errors between measured and simulated data. This last step is achieved by iteratively calculating the parameters using built-in or custom model equations from measured data, and/or by using automated numerical optimization techniques. Knowm, Inc. provides several different memristors types, a full technology stack and BEOL (Back End Of Line) services for designing memristor-based circuits utilizing industry standard CMOS processes. nSpace Labs, a New Mexico based company is working with Knowm to support their technology in professional tools that will assist researchers, device engineers and circuit designers in developing their own memristive devices or memristor-based circuits using Knowm provided memristors. Providing accessible and reliable models and simulator support will be key to the adoption of memristors for use in non-volatile memory, sensors or other complex circuits needed for neuromorphic and machine learning applications. Providing accessible and reliable models and simulator support will be key to the adoption of memristors for use in non-volatile memory, sensors or other complex circuits needed for neuromorphic and machine learning applications. Keysight Technologies’, IC-CAP (Integrated Circuit Characterization and Analysis Program) is a commercial Electronic Design Automation (EDA) package used for model development, device characterization, and parameter extraction. It provides an open flexible software architecture supporting many industry standard and proprietary models however to date there has been no modeling support for memristors. 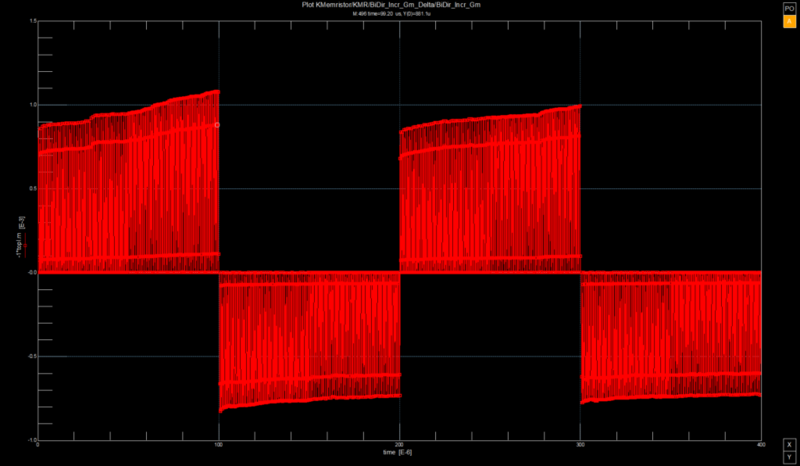 Using IC-CAP’s integrated Python programming environment, nSpace Labs is developing an add-on package that provides the features necessary to acquire measured data using the Keysight B1500A Semiconductor Device Analyzer which can be configured with multiple high-resolution SMUs (Source Measurement Units) and an integrated B1530A WGFMU (Waveform Generator/Fast Measurement Unit) to apply pulsed and arbitrary waveforms to the memristor’s electrodes while simultaneously performing Fast-IV measurements to accurately characterize and extract model parameters. IC-CAP also provides wafer probe control, data storage and statistical analysis for determining parameter distributions extracted from multiple measured datasets. This allows for the creation of statistically significant models to enable corner case analysis for circuit designs. This capability is also especially important for a newer technology like memristors since the data can also be used for quality control and reliability studies and help refine future manufacturing processes. The Knowm MSS (Multi-Stable Switch) model is an accurate model that captures the behavior of memristors at a level of abstraction sufficient to enable efficient circuit simulations while simultaneously describing a wide range of possible devices including Ag-Chalcogenide, AIST, GST, and WOx devices. The MSS model provides the description of an idealized two-state element that switches probabilistically between its two states as a function of applied voltage bias and temperature. A single memristor is modeled by a collection of MSSs states changing over time, which captures the memory-enabling hysteresis behavior. In this semi-empirical model, the total current through the device is realized from both a memory-dependent (MSS) current component and a Schottky diode current. The Schottky diode effect accounts for the exponential behavior found in many devices and allows for the accurate modeling of that effect, which the MSS component cannot capture alone. 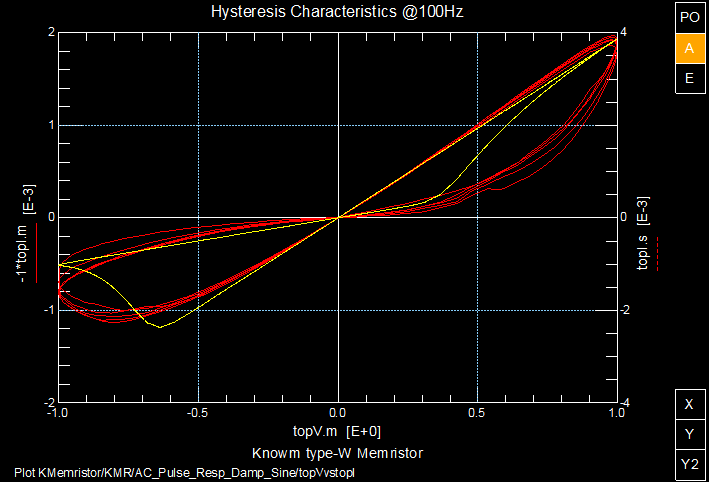 The latest implementation of the MSS model has been coded using Verilog-A so additional numerical equations can be added to account for more complex behaviors and simulating various failure modes. The Verilog-A model can be automatically compiled and used in Keysight’s ADS or can be converted to C++, compiled and dynamically linked using hooks in parallel simulation engines like Xyce available for download as an open-source version from Sandia National Laboratories. Using either of these simulation platforms the designer will be able to define netlists to simulate multiple MSS memristors with different state potentials that can be combined in parallel or series to model increasingly complex state-based systems. …the designer will be able to define netlists to simulate multiple MSS memristors with different state potentials that can be combined in parallel or series to model increasingly complex state-based systems. Michael Arendall is an experienced software developer, entrepreneur and innovator with more than 25 years experience working with leading semiconductor manufacturers, academia and government laboratories; directly supporting research and development labs by building tools and apparatus for characterizing, analyzing and performing reliability studies on advanced semiconductor process nodes.